I've always been disappointed by vegetarian gravy. The instant stuff is just full of chemicals and tastes like it; other recipes I've tried are either tasteless or taste of Marmite, which I don't really like. 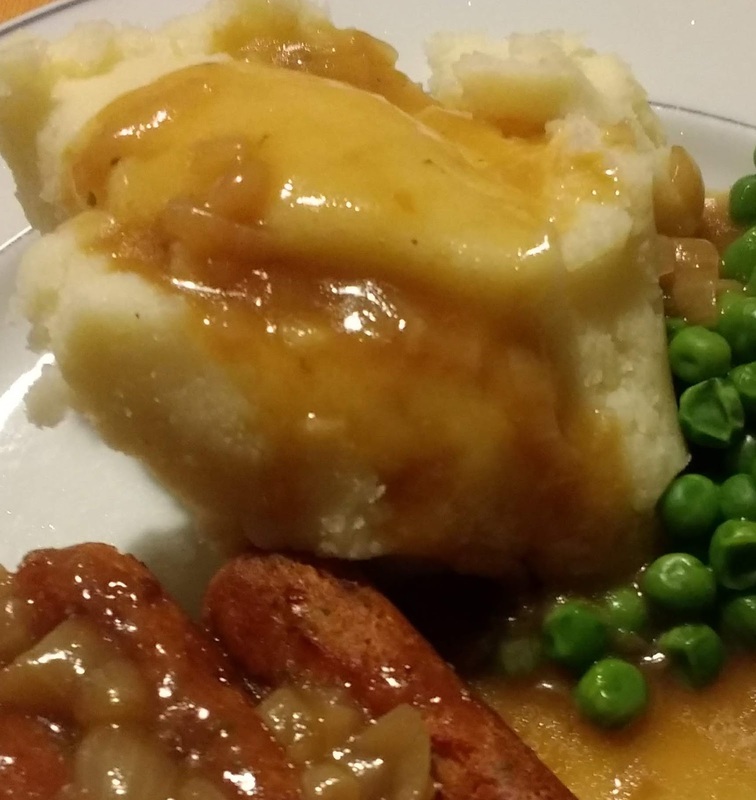 So a while ago I thought I'd set myself the task of making nice gravy, combining a few ideas I found on the internet. This is my easy vegetarian onion gravy recipe; I hope you like onions! I use sunflower oil and olive oil interchangeably, normally because I pick up the wrong bottle. But a flavourless oil is ok for this, so sunflower oil will do instead of olive oil. The sugar is a refinement so not completely necessary if you don't like the idea. The onions will start to caramelise eventually without it, but I think it adds a little something. We have it in our cupboard for baking anyway, and I'm not a believer in the idea that sugar is somehow evil, I just think people eat too much, mostly in processed food. Because we rarely eat processed food I don't worry about it. You can add a clove of crushed garlic with the onion if you like; I don't because I don't think it's necessary. Gravy needs to be salty but there's plenty of salt in the soy sauce and the stock so no need to add any. If you need to make it gluten-free be aware that most soy sauce has wheat in it. A lot of people seem to make gravy in a skillet or frying pan. I think this comes from making it in the meat pan with the juices, but I really think a small saucepan with a heavy base is better. The heavy base is important to stop the onion sticking. this should make enough for four normal people but our five year old loves gravy, so for us it only feeds three. Peel the onion and slice finely. How fine depends on how you like your gravy - I like identifiable bits of onion, but not so big that it feels as though I'm eating onion. If you chop it small enough it'll pretty much disappear. Put enough oil in the pan to cover the bottom and a bit more, put in the onion and sprinkle about half a teaspoon of sugar over it. Stir with a wooden spoon, heat until it's just sizzling and then turn it down until the onion is still cooking but not enough to burn or go crispy. You need to leave it cooking for quite a while. How long depends on the onion and the temperature, but bank on about 15-20 minutes, longer without the sugar. You're looking for the onions turning a golden colour - if you let them get darker the gravy will have a stronger flavour, it's up to you. Stir it from time to time - if it's starting to stick turn the heat down. Once the onion looks about right, add the flour and stir in. Leave it to cook without adjusting the heat while you make the stock. Pour the stock on, add the soy sauce and stir. Bring to the boil, stir and reduce the heat to a rolling boil. That's more than a simmer but in no danger of boiling over. Leave the lid off so that it can reduce. You want the gravy to reduce a fair bit and thicken. This will happen with time; keep stirring occasionally and checking the thickness. It should lose between a quarter and half of its original volume. When it's the right consistency taste it and add black pepper to taste. Pour it into a warmed gravy boat or jug and serve straight away.